doberman pizza | doberman pizza. 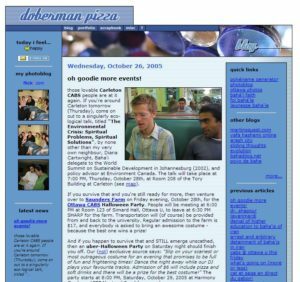 doberman pizza has existed for a long time, and I’ve been blogging on it since the early 2000s. Every now and then, I’ll post news about it: redesigns, updates, and tweaks. One post a day, November 1st to 30th. It’s that simple. Doberman Pizza will be participating. Will you? So yeah. How are you, O dearly beloved reader of doberman pizza? As I noted earlier, you shall be seeing much more than scattered Facebook reposts from now on. For various reasons, blog posts have been scarce over the past few years—mainly because of the workload involved in preparing for our wedding, recovering from a loved one’s passing, and filling out the paperwork required for Quynh’s immigration to Canada. As well, since the recent social media boom and the rise of Facebook, Twitter and similar networks, random status updates have just been easier to post elsewhere than here. But fear not! There’s no reason to unsubscribe. Starting this week, doberman pizza gets a much-needed overhaul and relaunch. See you here on Thursday evening, December 6th, around 5 PM Eastern Time and onwards (see World Times) for the big switch, and, who knows, maybe a little real-time chat like the old days. I’ve been working at getting things ready for the past month now, and I really hope you’ll like it. 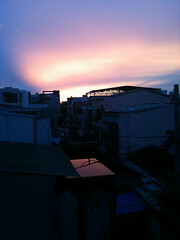 my recent trip to Vietnam to visit family after my father-in-law’s passing afforded me a lot of time to think. 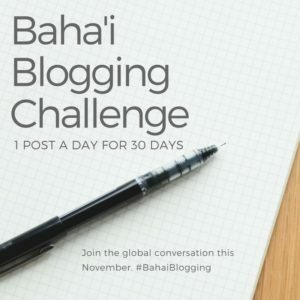 Even while I was still there, I knew I wanted to share with the world reflections on the experience of losing a loved one across cultures, from a personal and a Baha’i perspective. as it turns out, I’ve actually got a lot of notes, so much so that it’d probably take way more effort than I can give at the moment to put it all into one big essay-type format. So I figure I’ll split it into a few posts, covering a few different—but very related—topics. These may change, but I figured people might like to know what I’m planning. As noted, I expect these posts will come out every 3–4 days, as I have time to work on each of them (that said, the dates noted here are approximate). 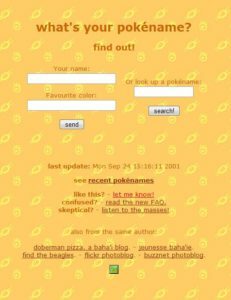 Edit: All posts are now up (finally)!